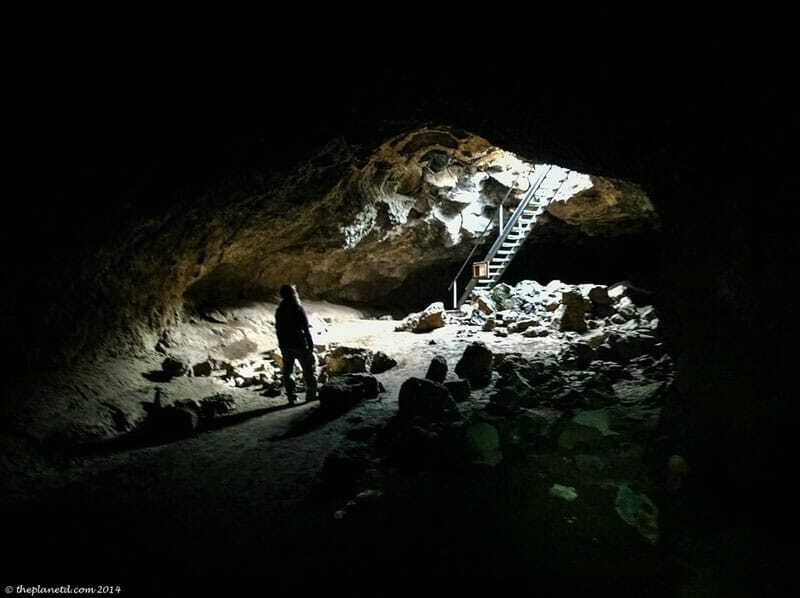 Did you know Oregon has 1000-year-old lava tubes that you can explore near Bend? 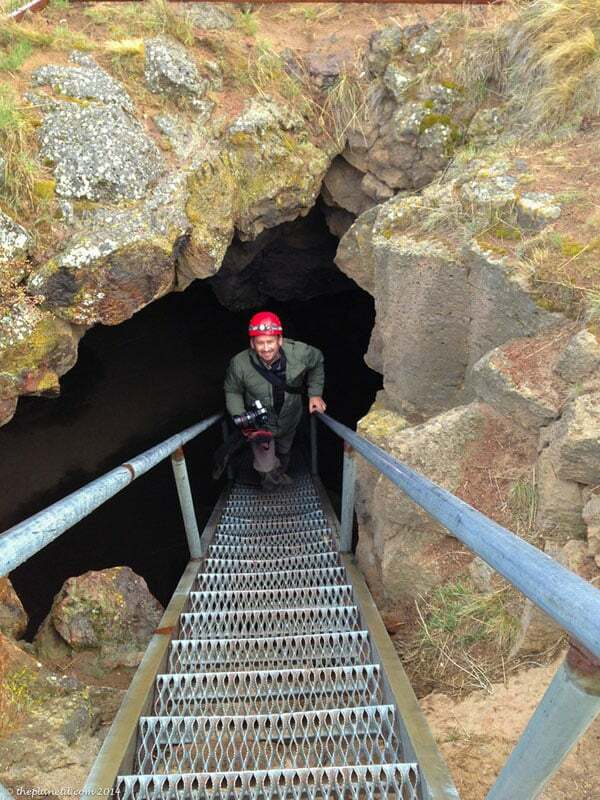 When visiting the area of Smith Rock in Central Oregon, most itineraries include rock climbing, horseback riding, a ranch visit and several hikes, but did you know there is a fascinating system underground too? Deschutes County encompassing the cities of Bend, Sisters, and Redmond (our 3 stops on our Oregon adventure) houses 1000 lava tubes created by volcanic activity thousands of years ago. 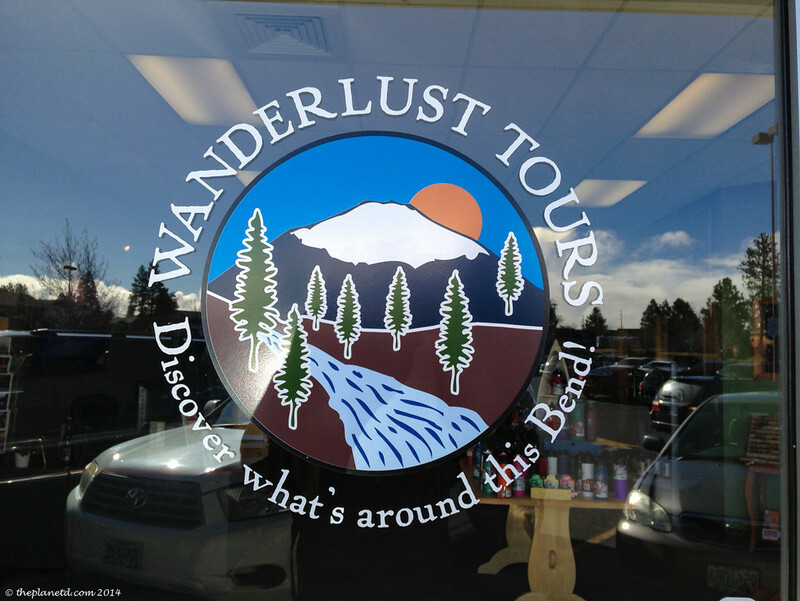 We met up with our guide Nick of Wanderlust Tours in the town of Bend. Our directions stated “in the Fred Meyer parking lot” I guess Fred Meyer is a big chain of stores, but Dave and I had the hardest time finding it. We were like, “Maybe Fred Meyer is the mayor of the town and it's in the main square. Eventually, we stumbled across a big parking lot housing a big “Fred Meyer” sign and turned in. Sure enough, Wanderlust Tours is located right inside. Ha, it's an adventure wherever we go. The drive to the Boyd Lava Tube was about 20 minutes. Nick told us about the history and geology of the area during the ride. It was a windy day and as we got out of the van, we were thankful we were going underground. 60 feet underground to be exact. We walked down a set of metal stairs and began the tour. Dave stayed behind to grab some photographs while I listened to Nick tell us the history. That's how things usually go on our tours, Dave wanders off to take his incredible photographs and I stay close taking notes on my iPhone while everyone else in the group thinks I'm busy browsing Facebook or something. 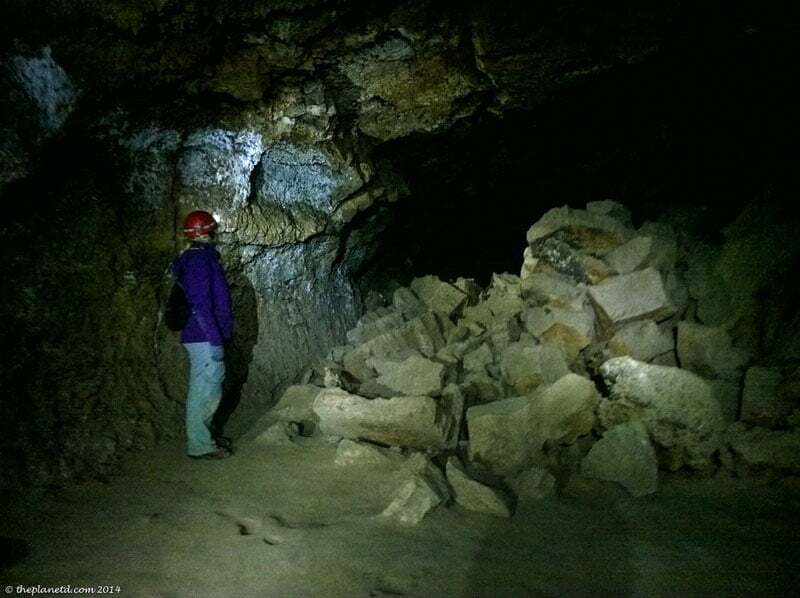 There are 1000 lava tubes in the area and most of them house hibernating bats in the winter. They are not open to the public. 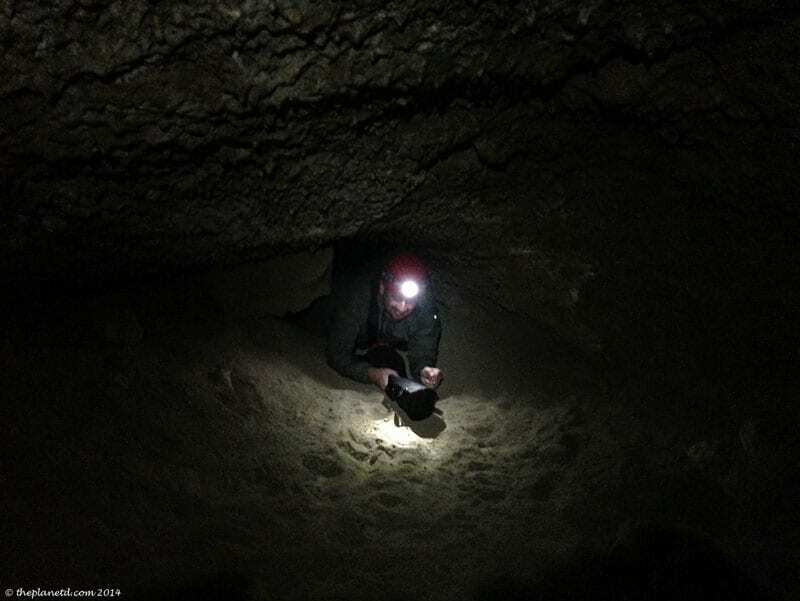 The Boyd Lava Cave has only one very narrow opening making entry and exit difficult for bats. That's a good thing for tours as it is the only cave still open to the public so as not to disturb the bats. Nick explained to us that bats are true hibernating animals, unlike bears. Bears eat a lot of food, store their fat and simply sleep in the winter. Bats, don't stock up on food, instead they slow down their metabolisms, drop their heart rates and lower their body temperature. It would be very dangerous to wake them in the middle of hibernation because they would need to immediately look for food and there aren't any insects around in the middle of winter. So the lava tubes that bats frequent are closed to the public. Dark corners are a perfect place for a bat to hibernate. 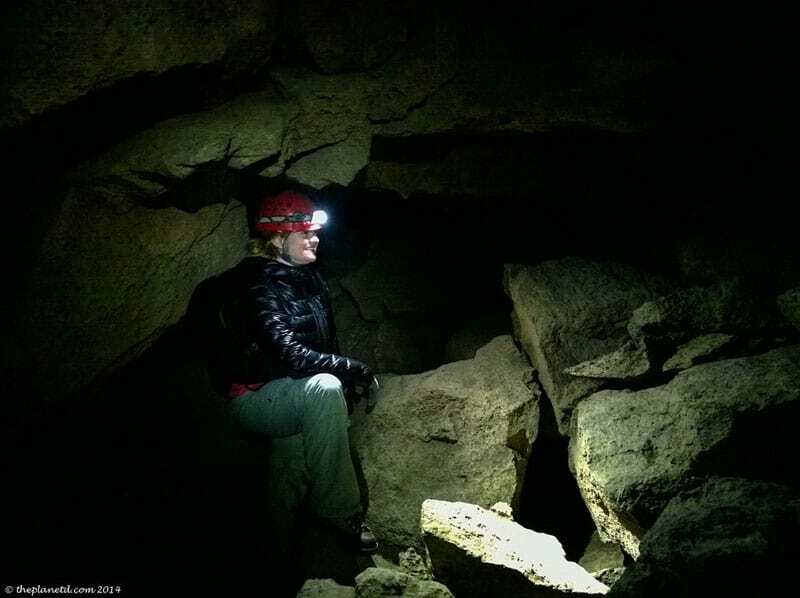 When exploring Boyd Cave, be sure to take extra batteries and more than one headlamp. There are no other light sources besides the entrance and the cave runs 1800 feet (600 metres) long. Within minutes we were in complete darkness. Have you ever been in the dark where absolutely no light can enter? It's a creepy feeling to not be able to even see the slightest shadow. 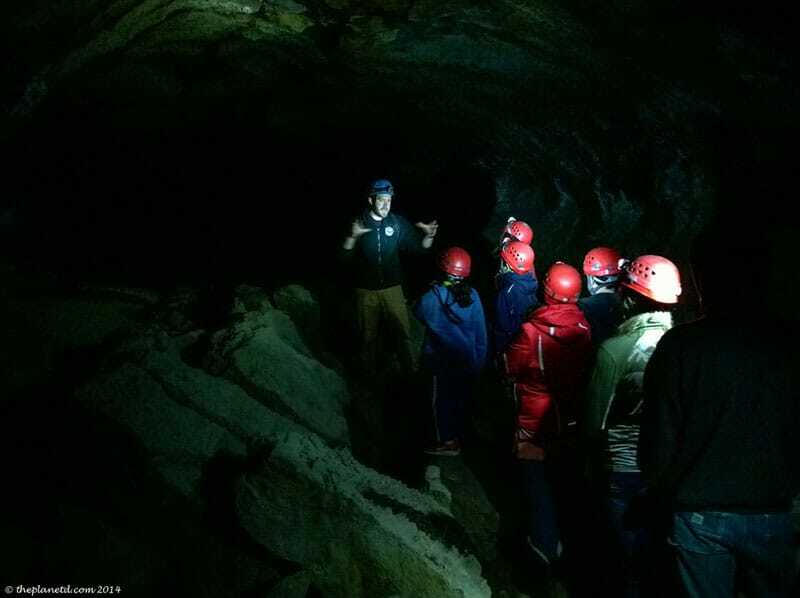 At one point during our tour, Nick had us all turn our headlamps off to experience it. It was only a few seconds before someone turned their headlamp back on. I am assuming because they were a little freaked out. I remember eating at O Noir in Toronto a few years ago. It is a dark dining experience to help customers understand what life is like for the visually impaired. Visually impaired servers also work there. It took me a while to get over the anxiety of being in complete darkness. Even though it was already black inside, I kept my eyes squeezed shut through the entire experience because when I opened them and saw nothing, but grew anxious. I'm sure that person was experiencing what I felt during my dining adventure. The tour lasted about an hour and a half where we crawled through thin cracks, over rock rubble and on smooth paths. How Were the Lava Tubes Made? The tubes were made from an eruption 150,000 years ago. It was the first large eruption causing giant lava rivers flowing through the valley. Over the next tens of thousands of years, smaller eruptions occurred creating smaller rivers. There was a little trench in the side of the huge cave that was caused by one of the later eruptions. It looked like a little ditch on the side of the road. We walked right to the end of the line. Nick told us that not everyone makes it, but I have a feeling he was just being nice. It wasn't that difficult at all and we've been through plenty of narrower passages. For the most part, the lava tube is very wide and spacious with just a few small squeezes and one final crawl space where you have to get down on your hands and knees. It is a very short crawl, so you won't feel any anxiety. We had a tour of all ages. A three-generation family was on tour with us, and the grandmother was crawling through with as much gusto as her grandkids. So don't be afraid, the Lava Tube tour is fascinating, fun, and one of the most unique experiences you'll have in Oregon. 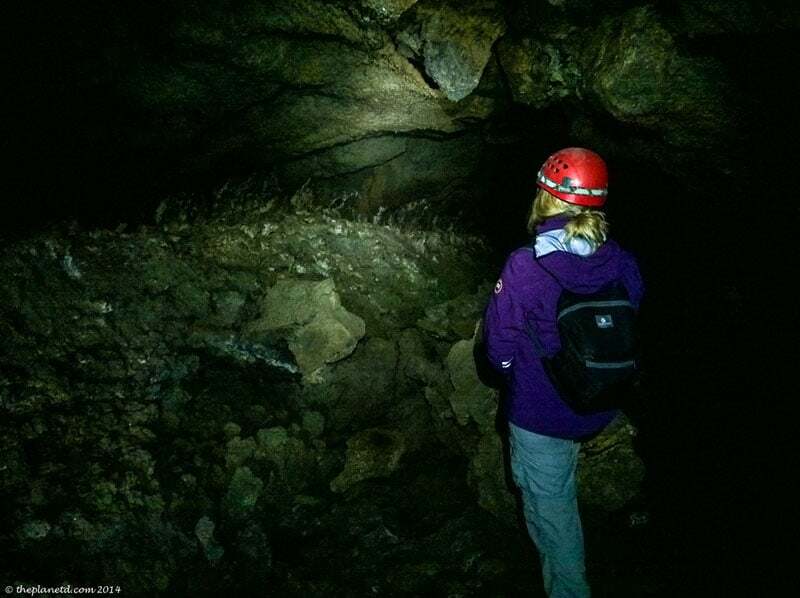 If you are exploring on your own (which you shouldn't be because Wanderlust Tours has permits and others in the caves are exploring illegally) make sure to bring an extra headlamp or flashlight with extra batteries. You don't want to be trying to make your way back in the dark. Our Tour was provided by Wanderlust Tours. TripAdvisor's number one rated tour company in Bend. We understand why these guides are passionate about their jobs! I have never had a guide make rock history so much fun. Nick loved talking about the different types of lava flows. Yes, I learned a lot that day and retained it. You know why? Because it was fun! And if you go on a Lava Tube Tour You'll have fun too! For more on Oregon visit the Travel Oregon Website and explore their Seven Wonders of Oregon. We spent our time exploring one of them known as Smith Rock and we can't wait to see the remaining Six in the near future. Thank you, Oregon for having us! Be sure to check out their Instagram feed. Influencers like us have helped them build it and there are some amazing photographs. 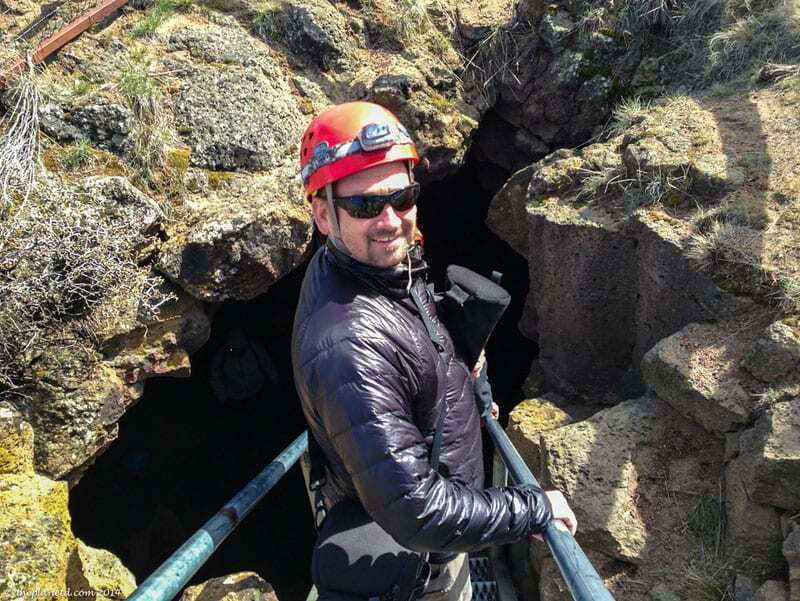 14 Responses to "Exploring the Lava Tubes of Bend, Oregon"
Looks like a one of a kind experience! Must have been strange but maybe peaceful too to turn off all the headlamps and just be in the darkness. Very interesting about the restaurant in Toronto. Thanks for sharing! This looks adventurous but a little scary at the same time. Can I reblog the photos on my blog, of-course with credits to you and Deb. No thanks, we’d prefer to let this post stay on our blog. Cheers. This looks like great fun! 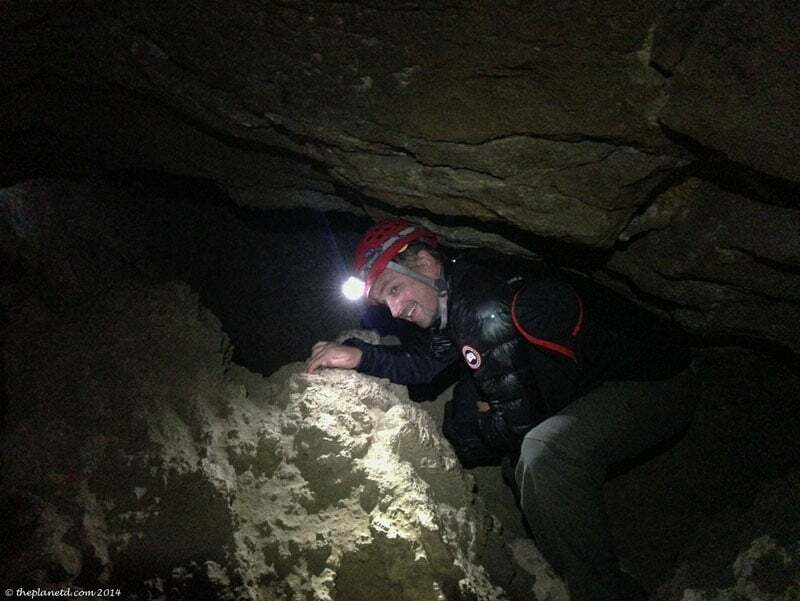 I love caves, and I can do without the bats–so I’m glad their tubes are closed. Yep, no bats in this cave. They want to make sure they don’t disrupt the eco-system so the caves with the bats are protected. They are such an important part of the food chain. I never honestly considered Oregon for the travel destination until I was seeing your Instagrams from your trip. Looks beautiful and like an excellent destination for adventure travel! 40 years ago, (wow really that long ago!) A another woman and I took our kids my 3 and her 4 and one she was babysitting through here. The oldest were 8 and the two youngest were 2, we had one flashlight…we had a wonderful time. The stairs weren’t there at that time, you had to climb down. 8 kids under 8 what a day. Now that would have been an adventure without the stairs! Very cool that you were there 40 years ago! Way to go to have an adventurous spirit all your life! These lava tubes remind me of the Ape caves found near Mt. St. Helens. With fallen debris and darkness to traverse. Great photos and post. I can imagine they’d be very similar. Sort of the same area and both from volcanic activity. I’ll definitely check out the Ape Caves if we make it to Mt. St. Helens one day, thanks for the heads up!And thank you for the kind words. Nice one, this reminds me of Vietnam’s largest cave, the light effect though (but then again they’re all caves!). Be safe always on your adventures! Yep, that’s the only thing it’s missing the lighting effects. Are you talking about the cave at Ha Long Bay? We visited that one as well and it was spectacular. When we saw it they had it all lit up with red, green and regular lighting. But you could really get a sense of how big it was.